The majestic geological force of nature is not the only phenomenon of one of the world’s foremost natural wonders. Paintings and carvings on Canyon walls, providing archaeological evidence of the presence of the nomadic Archaic people between 6500 BC and 300 AD.nyon walls, is astounding. Today, five major Native American tribes, the Havasupai, Hopi, Hualapai, Paiute, and Navajo, and several smaller ones trace their ancestry to nomadic peoples who moved up and down the vertical layers of the Canyon walls and plateaus hunting, gathering and harvesting seasonally planted food for nearly 13,000 years. For these indigenous tribes, the Canyon is of deep spiritual significance. Traditions based on ancient beliefs surrounding the mysteries of this sacred place are rooted in their oral histories passed down through generations. In 1540, the Canyon proved to be an obstacle for the first Europeans to see it. A small party of Spanish explorers who were part of Francisco Vasquez de Coronado’s expedition searing for gold in the mystical 7 cities of Cibola, were led to the South Rim by Hopi guides. Through a treaty that ended the Mexican-American War in 1848, the U.S. acquired a vast portion of the Southwest, including the Grand Canyon, from Mexico and set out to map it out. It did not take long for the Canyon and nearby plateaus to grab the attention of miners, loggers, and ranchers. As American interests moved westward, roads and railroad lines were built to transport ore, logs, and livestock to growing American markets. The increasing extraction of natural resources threatened the magnificent Grand Canyon. Along with vast amounts of federal land, it was placed under the U.S. Forest Service in 1893. In 1919, the National Park Service took over management of the inner Canyon and portions of the North and South Rims. Today, Grand Canyon National Park covers only a small portion of the larger geological feature known as the Grand Canyon. Debates over the control of cultural heritage, vast resources, national forests around the Grand Canyon, Native American reservations and public and private lands, are on-going. If you are in Las Vegas or Sedona, a day trip to this natural wonder is a must for visitors of all ages. While many have tried to capture its grandeur through beautiful landscape art, expressive prose, and scientific description, all fall short. It’s something that has to be experienced. One thing to prepare for is the heat. It’s very hot so be sure to wear loose clothing and a hat, apply sunblock and drink plenty of water. South Rim is a 2 hr. A 15-minute ride from Sedona, within the National Park, where there is a Visitor Center, museum, hiking trailheads, endless viewpoints and some park lodges. West Rim is a 2.5-hour ride from Las Vegas. This portion of the West Rim is owned and operated by the Hualapai Tribe, which also operates the amazing Skywalk. Both Sedona and Las Vegas offer multiple daily guided tour excursions on small and large buses, Jeeps, and Humvees; helicopters, small planes. Some offer combo packages of air and ground tours. Choose one that fits your available time, budget, and interests. Driving to South Rim is an option. Parking is limited and challenging. There are many areas from which to see amazing vistas. Amenities and information can be found throughout Grand Canyon Village and in the Visitor Center. Experienced hikers can hike several trailheads around the South Rim during May through September hiking season. Bright Angel Trail is very popular. South Rim Mule Rides are fun, however, due to the limited number of people they can accommodate you will have to book over a year in advance. Helicopters offering 25-45 minute rides down into the Canyon take off from Grand Canyon village. The best choice for visitors is to avoid driving and parking hassles on a guided van, jeep or bus tours offering free hotel pick-up and all-day guided adventures. If you are going to spend a full 10-11 hour day visiting one of the world’s most incredible natural sites, make it a really cool ride! Trusted Tours & Attractions offers a great choice at a discounted rate. Pink Jeep’s Grand Canyon Deluxe Tour will transport you there by Trekker, the ultimate tour vehicle designed especially for Grand Canyon tours. It seats 10 in total comfort and luxury– leather reclining seats, unparalleled viewing windows, recharging stations for electronics, important for endless photo ops. Great informative guides add a personal touch to the experience. The drive through scenic Oak Creek Canyon and Ponderosa Pines Forest is amazing. Lunch at historic El Tovar Hotel or Bright Angel Lodge is a treat. You’ll have plenty of time at South Rim to take it all in. Chill on the beautiful ride back with Colorado River views and a stop at Cameron Trading Post on the Navajo Indian Reservation. Las Vegas offers several over-the-top ways to experience the West Rim – guided bus, van, Jeep and Humvee, helicopter, plane tours, and combo packages. Trusted Tours & Attractions offers discounted rates to two great guided Grand Canyon tours offered by Pink Jeep. Both 8-9 hour adventures aboard comfortable 4×4 vehicles include hotel pick-up, lunch, and wonderful guides. On Grand Canyon Classic West Rim Jeep Tour, kick back, relax and enjoy an amazing ride through some of the most dramatic and scenic landscapes in America. Stop for photo ops at awesome Hoover Dam, drive by beautiful Lake Mead, through striking Joshua Tree Forest and rustic towns, and along the Colorado River –all this before arriving West Rim, the most spectacular of all. For those not afraid of heights, walking over the glass-floored Skywalk, suspended 4000 feet out over the Canyon, is a must. Grand Canyon Drive, Fly, Float Tour is the ultimate! It’s a day of filled with one spectacular adventure after the other. Start out on the same great tour as the Classic West Rim Tour. 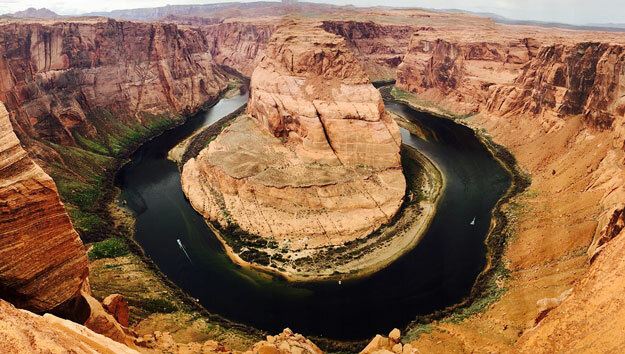 Once at the Rim, board a helicopter for a swooping thrill ride down through the Canyon to the edge of the Colorado River where a pontoon boat waits to take you on a boat ride with Canyon walls towering overhead. Then, it’s back on the helicopter, up, up and away, to the summit for lunch!